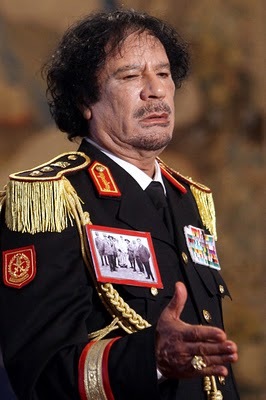 Muammar al-Qaddafi is neither a president nor a king (although he did call himself ‘King of Kings’ at one Arab summit). No, what he is, as well as Colonel, is the Brother Leader, and the Guide of the First of September Great Revolution of the Socialist People’s Libyan Arab State-of-the-Masses (he invented the Arabic word jamahiriyya for the last chunk). I’ll refer to him here as Qaddafi. Qaddafi is famous for grandstanding – his female bodyguards, his tent, his flamboyant dress. In interviews he growls and flicks his hands. At Arab League meetings he puts his feet on the desk, smokes cigarettes, gets into shouting matches, dramatically swans out. Sometimes he says things worth saying, and he’s often provided a laugh for Arabs who don’t live in Libya. Qaddafi thinks he’s a lady-killing revolutionary of Guevara proportions and a tyrant of the stature of Mao; hence his Green Book (not to forget his fiction). At the same time, he thinks the people, not he, are in control of Libya’s destiny. And perhaps – we can hope after Tunisia and Egypt – he’s right. Ideologically he’s swung from Arabism to Islamic socialism to pan-Africanism, but it’s all been hot air. His hosting of a diversity of ‘revolutionary’ groups, including religious cults, reinforced the impression that he was either stupid or insane. He has been clever enough to smother his people. There are no political parties and no independent media. Dissent is ruthlessly punished. Hisham Matar’s painful novel In the Country of Men, based on his father’s abduction, gives a taste of the melancholy and fear hanging over Libya. In 1996, 1200 prisoners were massacred at Abu Slim prison. Dissidents have been murdered even after escaping abroad. And Qaddafi is wanted in Lebanon for the murder of Imam Musa as-Sadr. Qaddafi has mismanaged the economy by harebrained schemes and family corruption. He invested in a pointless WMD programme, then cemented his new friendship with the West by dismantling it. He does have a lot of hydrocarbon-cash to play with. In response to current unrest he’s doubled public sector salaries. In May 2006, America and Libya restored full diplomatic relations (Qaddafi had been helping out with rendered suspects for a while before that). In August, Qaddafi called upon Libyans to kill the enemies of the First of September Great Revolution of the Socialist People’s Libyan Arab State-of-the-Masses. Which remains his policy. At least two people were killed yesterday, February 16th, after demonstrations led by families of the Abu Slim victims. In Beyida, Benghazi and Zentan people have protested and burnt police stations. Libya lies between Tunisia and Egypt. In the 70’s he was called. Alwalid almejnoon “Crazy boy”. No longer a boy, yet still “mejnoon”. Time for the dust bin for him.